Cold Start, But Great Finish! Not quite up to freezing mark yesterday morning, but the day finished out in the low 50s. Today is going to be a breath of spring, and basically, so is the weekend and into next week. Some showers are predicted for tomorrow, but temperatures in the upper 40s. Sunday back into the upper 50s, AND low 70s for both Monday and Tuesday. Be still my beating heart! Cool down Wednesday, 40s, and then back into the 50-60s. So far this week, we have had generation all day every day. Today is another story. Generators went off at 8:00 a.m. (I am writing this in a hurry) and will be off all day. As I said, not quite to freezing mark yesterday when Stan pulled out of the drive with his drift boat. 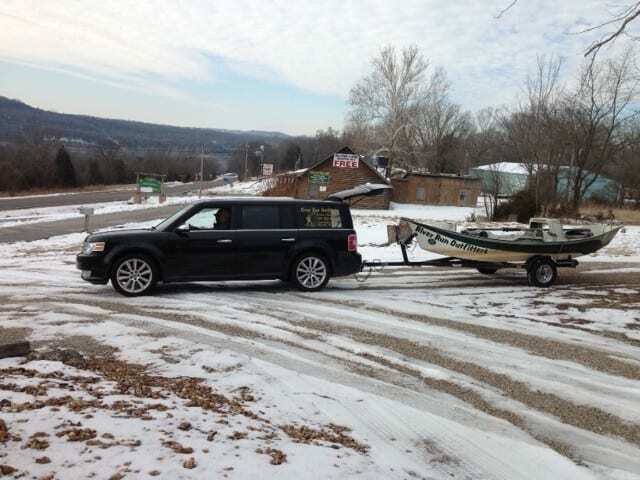 We were so thankful the boat ramp had been cleared! 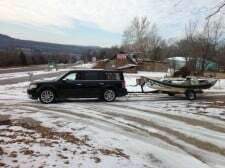 A couple of his guys, who braved a white-knuckle trip from Illinois over the weekend to come here and fish, Don and Steve, were going fishing! Great day on the “creek” for these two on the big ruby with either a P&P or blue poison dropper in the a.m. As the day progressed, it was the P&P or copper dun midge droppers. Fish seemed to be in pods. You would fish a ways and not have a hit, then reach a section where you couldn’t keep them off. Jim had Derek, also from Illinois, out for the first day of his two-day fishing. We’ll report on them tomorrow as we’re not sure what patterns they were stripping yesterday. Carolyn took Ron and Kathy, from Louisiana, out all day. Lots of catching for them on the blue poison and lightning bug droppers. Late in the afternoon, way downstream, the egg pattern was working best. 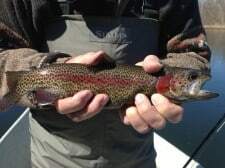 Not Ron’s largest fish, but certainly a beautiful male. Had to get a picture of him. Great day on the water! This entry was posted on Friday, March 7th, 2014 at 12:33 pm	and is filed under Fishing Reports. You can follow any responses to this entry through the RSS 2.0 feed. You can leave a response, or trackback from your own site.